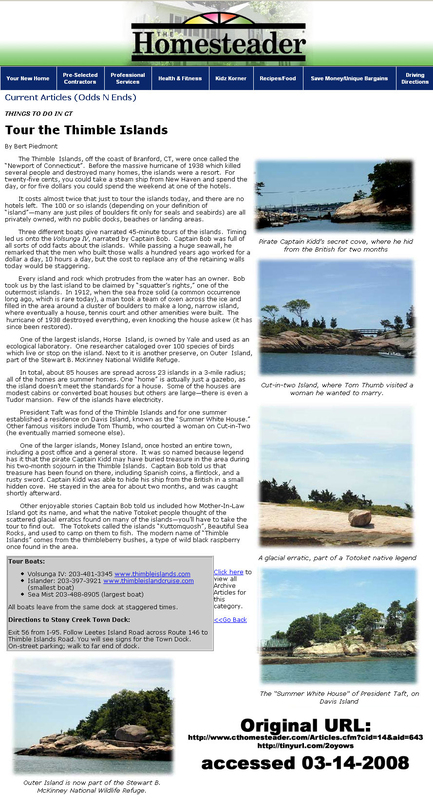 The Thimble Islands, off the coast of Branford, CT, were once called the “Newport of Connecticut”. Before the massive hurricane of 1938, which killed several people and destroyed many homes, the islands were a resort. For twenty-five cents, you could take a steam ship from New Haven and spend the day, or for five dollars you could spend the weekend at one of the hotels. It costs almost twice that just to tour the islands today, and there are no hotels left. The 100 or so islands (depending on your definition of “island"—many are just piles of boulders fit only for seals and seabirds) are all privately owned, with no public docks, beaches or landing areas. Three different boats give narrated 45-minute tours of the islands. Timing led us onto the Volsunga IV, narrated by Captain Bob. Captain Bob was full of all sorts of odd facts about the islands. While passing a huge seawall, he remarked that the men who built those walls a hundred years ago worked for a dollar a day, 10 hours a day, but the cost to replace any of the retaining walls today would be staggering. Every island and rock which protrudes from the water has an owner. Bob took us by the last island to be claimed by “squatter’s rights,” one of the outermost islands. In 1912, when the sea froze solid (a common occurrence long ago, which is rare today), a man took a team of oxen across the ice and filled in the area around a cluster of boulders to make a long, narrow island, where eventually a house, tennis court and other amenities were built. The hurricane of 1938 destroyed everything, even knocking the house askew (it has since been restored). One of the largest islands, Horse Island, is owned by Yale and used as an ecological laboratory. One researcher cataloged over 100species of birds which live or stop on the island. Next to it is another preserve, on Outer Island, part of the Stewart B. McKinnev National Wildlife Refuge. In total, about 85 houses are spread across 23 islands in a 3-mile radius; all of the homes are summer homes. One “home” is actually just a gazebo, as the island doesn't meet the standards for a house. Some of the houses are modest cabins or converted boat houses but others are large—there is even a Tudor mansion. Few of the islands have electricity. President Taft was fond of the Thimble Islands and for one summer established a residence on Davis Island, known as the “Summer White House.” Other famous visitors include Tom Thumb, who courted a woman on Cut-in-Two (he eventually married someone else). One of the larger islands, Money Island, once hosted an entire town, including a post office and a general store. It was so named because legend has it that the pirate Captain Kidd may have buried treasure in the area during his two-month sojourn in the Thimble Islands. Captain Bob told us that treasure has been found on there, including Spanish coins, a flintlock, and a rusty sword. Captain Kidd was able to hide his ship from the British in a small hidden cove. He staved in the area for about two months, and was caught shortly afterward. Other enjoyable stories Captain Bob told us included how Mother-In-Law Island got its name, and what the native Totoket people thought of the scattered glacial erratics found on many of the islands—you’ll have to take the tour to find out. The Totokets called the islands “Kuttomquosh”, Beautiful Sea Rocks, and used to camp on them to fish. The modern name of “Thimble Islands” comes from the thimbleberry bushes, a type of wild black raspberry once found in the area.